Our thoughts and prayers are with the people of Japan during the current devastating floods. We are hoping that all sake breweries are safe, but praying for those who have lost homes and loved ones. From us all at the British Sake Association. You are invited to make your very own sake pots with the renowned Japanese potter Imahiko Kawamura. Ima-san will guide you as you make a choko (cup) and either a tokkuri (bottle) or katakuchi (lipped dish for pouring sake), using a slab or coiled technique (no wheels). Marie will present a couple of sakes, one chilled and one warm, so this will be a chance to try out different drinking cups, and different temperatures. Throughout Ima-san will chat informally with Shirley and Marie about ceramics, as well as introducing us to some of the guiding principles of Japanese tableware. Imahiko Kawamura is a ceramic artist who exhibits regularly at museums and galleries in the UK and Japan. She specializes in making decorative porcelain vessels and vases with a crystalline glaze, using methods based on Japanese tableware. She enjoys passing on her extensive knowledge of working with clay to all levels, as well as introducing Japanese tableware and the history of Japanese ceramics. A selection of cheese and charcuterie on party-style platters will be provided. There will be a raffle, with a selection of prizes, mostly sake-related! For individuals new to the subject, this qualification offers a hands-on introduction to the world of Sake. You’ll explore the main styles and types of Sake through sight, smell and taste to develop an understanding of the key factors affecting flavours and aromas. How much? – £169.00 (cost as of October 2017, please inquire for latest prices) includes 8 different Sake samples, sourced from ‘Sam Sake’, food samples, workbook, tuition and examination…and unlimited tea and coffee! Non-members who pass 10% discount on the first year subscription on joining the BSA. Toji is usually translated as “master brewer” referring to the person responsible for the entire brewing process in a particular sake brewery. Highly skilled in the craft of sake brewing, a toji has to work over the years to gain the necessary knowledge and training about the practical business of producing sake and, as a final step, to pass an exam on topics such as fermentation and chemistry to qualify as a sake master brewer. In collaboration with the Japan Society, the British Sake Association is pleased to invite its members to an evening with Philip Harper, Japan’s first and only British toji. This is a very special joint event: expect a discussion and tasting of aged sakes, temperature and yeasts. Sake will be kindly supplied by SamSake and Tengu Sake. Accompanying the sake, we will serve a mixed sushi bento box with a side dish of broccoli and aubergine sesame sauce (vegetarian sushi is also available). In an informal atmosphere, Philip will talk about his experience in the sake world and discuss the production process of a sake brewery. It will also be a chance for you to ask Philip all those questions you have wanted to ask about sake. Philip Harper was born in Birmingham and raised in Cornwall. After graduating in English Literature at Oxford University, he went to Japan in 1988 on the Ministry of Education’s JET Programme, and worked as an English teacher in public schools in Osaka. Following this experience, he started working at Ume no Yado, a Japanese sake brewery in a rural town within Nara Prefecture. After around ten years or work and training, he qualified as a master brewer and has worked at breweries in prefectures including Ibaraki, Osaka and Kyoto. 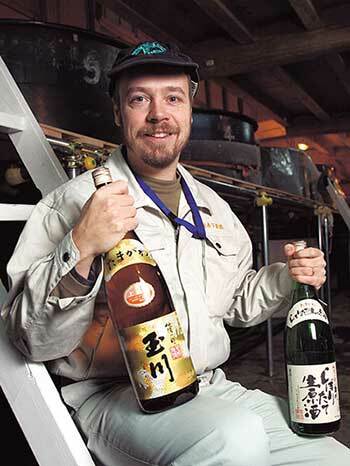 Philip is the author of The Insider’s Guide to Sake (1998) and The Book of Sake: A Connoisseurs Guide (2006), both published by Kodansha International.